Near Cedarburg, a bicyclist crosses a bridge on the Ozaukee Interurban Trail. We all know Milwaukee for its beer, bratwurst and oompah bands. But not many people know it’s also a great place for bicycling. Sure, there’s a constant stream of bicyclists on the lakefront stretch of the Oak Leaf Trail. From Lake Michigan, bicyclists can veer off onto a secluded stretch of the Milwaukee River or head toward Miller Park on the Hank Aaron Trail. They can ride west almost to Madison on the Glacial Drumlin Trail. They can head north on Lake Drive and, on the edge of the city, catch the Interurban Trail, which will take them to Cedarburg, Port Washington, Belgium and Oostburg. In town, more than 100 miles of paved off-road paths, parkway drives and connecting streets take bicyclists everywhere they want to go: to breweries for tours, to festivals or to the beach. Why drive a car? It’s so much easier to bike. One June, I rode the Interurban Trail in Ozaukee County, where electric trolleys ran between Milwaukee and Sheboygan until 1948. Today, the old railway is a 30-mile paved trail that links bicyclists and skaters from the Milwaukee suburbs to old German mill towns, a port town full of yachts and a village settled by Luxembourgers. You can get to it on a new extension of the Oak Leaf Trail, riding past Estabrook and Brown Deer parks. But I started in the town park of Mequon, one of the state's earliest German settlements, and within a block was in Thiensville, where a German immigrant built a mill along a bend in the Milwaukee River. A bicyclist gets a view of Milwaukee from the trail that runs through Reservoir Park. The bike trail parallels Main Street, but I found the interesting part of town — the stone mill, a cheerful coffee shop in a Victorian house, an old-fashioned village park — off Green Bay Road, just to the east. From Thiensville, the trail had barely left the houses behind before it entered Cedarburg, a popular getaway destination for people from Milwaukee and Chicago. Shops and a winery fill its 1864 woolen mill and the handsome stone buildings along Washington Avenue, where crowds were shopping and stuffing themselves with brats and strawberry shortcake during Strawberry Festival. A little trestle bridge crosses Cedar Creek in the middle of town and leads through quiet neighborhoods to Grafton, a Milwaukee River mill town that is not as carefully preserved as Cedarburg but still has many old stone buildings. One of the prettiest spots on the trail is just north of town, where a new iron bridge crosses the river. From there, the trail crosses over Interstate 43 and descends into Port Washington, a picturesque village with a marina full of charter fishing boats, a 1935 art deco light station and a historic downtown where Leland Stanford practiced law before he left to join the Gold Rush and become governor of California. At the quirky Pebble House, built in 1848 of mortar and round stones collected from the Lake Michigan beach, I ran into tourism director Kathleen Tank, who said bicyclists like the short distances between towns on the Interurban Trail. "People like it because they don't have to make a big deal about it," she said. "My daughter is 18, and sometimes she and her friends ride from Cedarburg to Port Washington for lunch and back again." In the marina, I watched a covey of ducklings and men being photographed with large catches of salmon. Back on the trail, I passed steep wooden steps that led to the blufftop 1860 light tower and museum and the imposing St. Mary's, an 1884 Gothic Revival church. From Port Washington, the trail to Belgium is straight and flat, perfect for in-line skating. From there, it continues across the county border to Oostburg, but bicyclists also can take a county road three miles east to Harrington State Park and its Lake Michigan beach. Cedarburg makes a good base for bicyclists; for more, see Jolly Cedarburg. The Oak Leaf Trail forms a rough loop. The Interurban was a great trail, but I found an even better one the next day, almost by accident. Riding past the Milwaukee Art Museum, I decided to take a spin on the Oak Leaf Trail, which I'd thought simply followed parkland along Lake Michigan. Instead, I found myself riding along a hillside and into a cocoon of greenery that follows the Milwaukee River under street level, much like the Midtown Greenway in Minneapolis. Yet, I couldn't see the river until I found my way to its banks along overgrown paths in Riverside Park, across from the Urban Ecology Center; its shores are so wooded I could spot only one building. Pedaling north, at street level but surrounded by trees, I had no idea where I was until the trail dumped me out onto a street. Another cyclist said I was in the suburb of Whitefish Bay. Following his advice, I rode Hampton Avenue east to Lake Michigan, where Lake Drive took me past a string of baronial manors that made those on Summit Avenue look like starter houses. Trying to catch a view of the lake, I got my wish in Atwater Park, a blufftop garden with a sweeping panorama and paved trails that wind down to a wide, sandy beach. Just over the city's border with Shorewood, I rejoined the Oak Leaf Trail in Lake Park and swooped down to the lakefront, watching a freighter on the lake as I rode back to the art museum and downtown. The next day, I went to the visitors center to beg for a bike map and found out the Oak Leaf Trail actually has 48 miles of paved off-road paths, 31 miles of parkway drives and 27 miles of connecting streets that eventually will be converted to off-road paths. 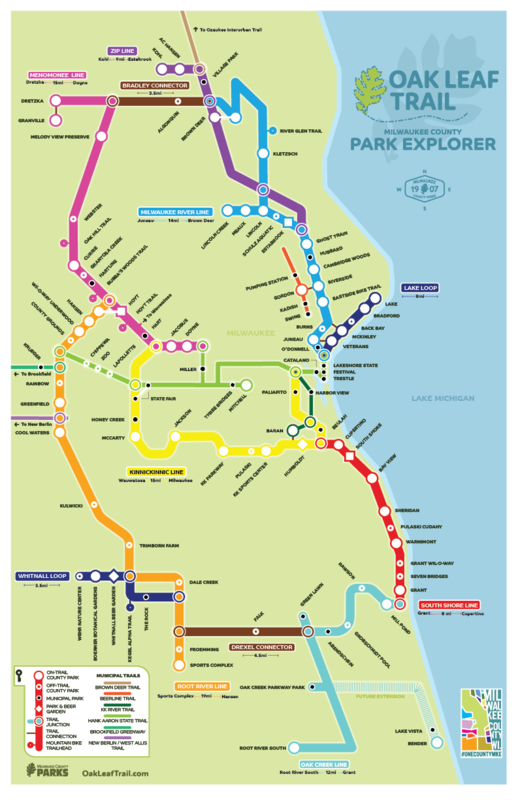 Like Minneapolis' Grand Rounds, the trail circles the city on parkways, following Lake Michigan and the Milwaukee, Menomonee and Root rivers; on its north edge, it connects to the Interurban Trail. Milwaukee is amazingly low-key and easy to navigate on a bicycle. In summer, I like to stay at Marquette University’s Straz Tower, where I take my bike up to my room on the elevator. If you don't have your own bike, you can rent a Bublr bike. From Marquette, it's a straight shot down Wisconsin Avenue to the lakefront. One July, I rode to Maier Festival Park and the nearby Lakeshore State Park, where you can camp if you've got your own boat. The Hank Aaron Trail passes the Pierhead Light near Lakeshore State Park. The white 1926 Breakwater Light sits at the harbor entrance, and it was a short ride to the 1907 cylindrical red Pierhead Lighthouse on the Hank Aaron State Trail, which connects the Oak Leaf Trail to Miller Park and the county line. Riding the Oak Leaf Trail on the bluff over newly spiffed-up Bradford Beach, I passed the recently restored 1887 North Point Lighthouse; it’s open Saturdays and Sundays from 1 to 4 p.m. Who knew Milwaukee had so many classic lighthouses? On the west bluff of the Milwaukee River north of downtown, I rode through Kilbourn Reservoir Park, created after the removal of a 135-year-old underground reservoir. It has a great view of downtown. I crossed the Milwaukee River on the Marsupial Bridge, a pedestrian/biking bridge that hangs from the Holton Street Viaduct like a baby kangaroo. It connects the Lakefront Brewery and Beerline B neighborhood to Brady Street and the Riverwalk. Then it was a quick spin to the Cathedral Square neighborhood and the Bastille Days festival, where I parked my bike near a miniature Eiffel Tower. For more on Milwaukee in summer, see Party in Milwaukee and other Milwaukee stories. For more trails near Milwaukee, see Bicycling in Wisconsin.